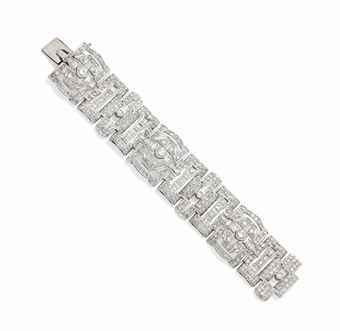 Pavé is a type of setting in which the gemstones or pastes are set very close together and no metal is showing from underneath. 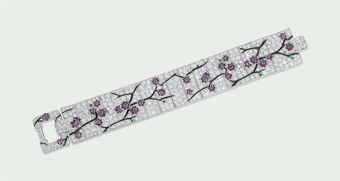 They stones are usually very small. The stones are held in place by small pieces of metal pushed over the girdle of the stone. The stones are often laid out in concentric circles. The word ‘pavé’ comes from the Middle French for ‘pavement’. 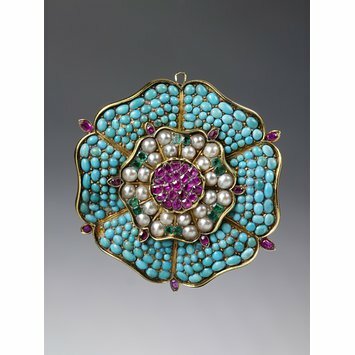 There are many fine examples of this setting in antique and period jewelry. 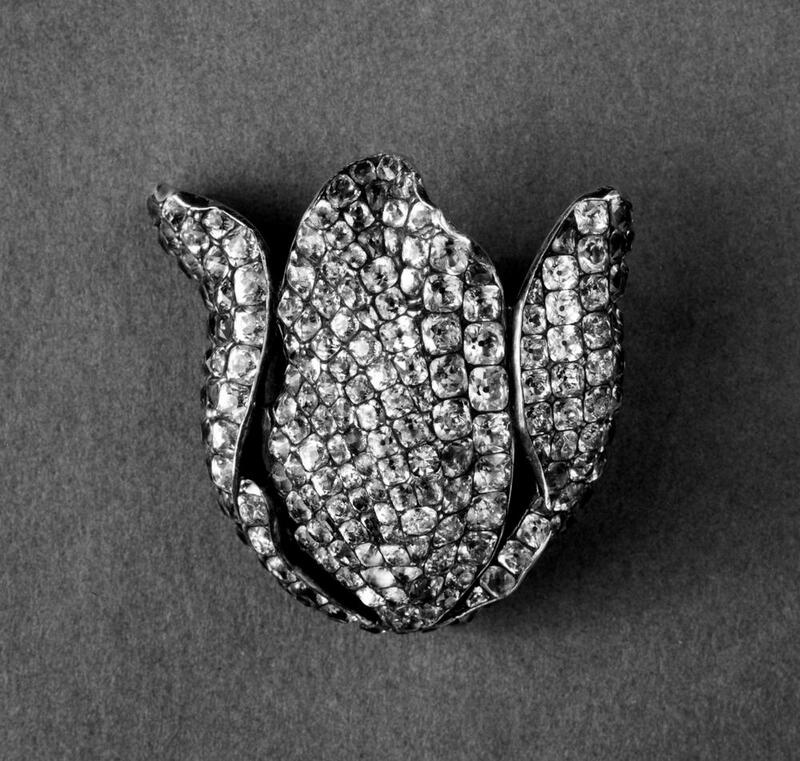 Dress Ornament, silver with pave pastes. During the Victorian era, there are a lot of examples of pavé turquoises. The color of turquoises was reminiscent of forget-me-nots, so would have had special meaning to the Victorians. 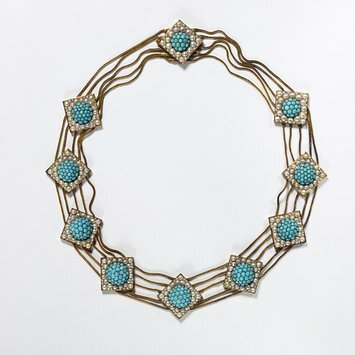 Necklace, gold, pave turquoises and half pearls. 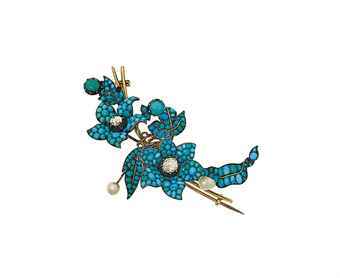 Victorian pavé cabochon turquoise, rose-cut diamond and pearl floral spray brooch. Art Nouveau designers were also fond of using Pavé settings. 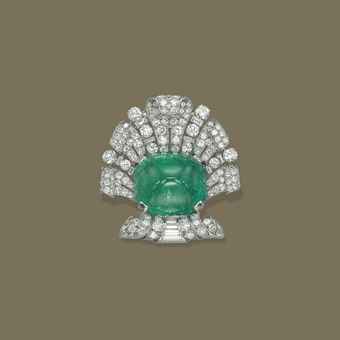 During the Art Deco era, pavé set diamonds alone or accented with other boldly colored gems were especially popular to the point of being a signature style of the era.